Cigarette card collecting, or cartophily to give the hobby its correct name, is such a massive subject that there is no way any one website could cover it in any detail. In fact there are so many subjects covered by cigarette cards that I doubt anyone could even name them all !! One of those is of course football, which is what this site is all about !! 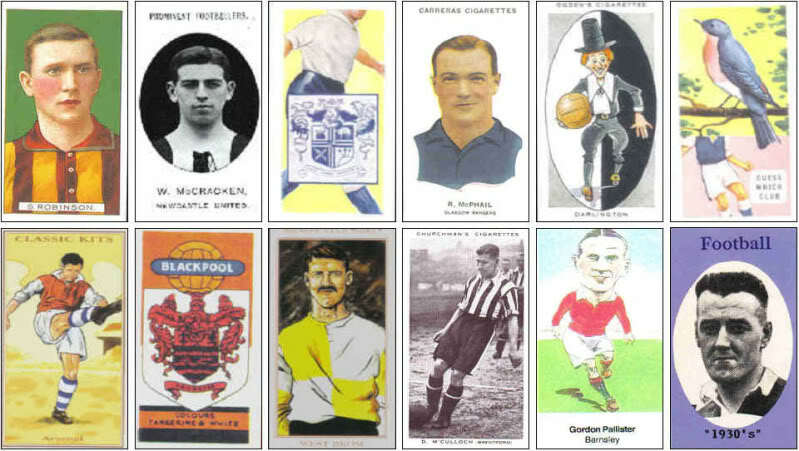 Again, there are countless issues of cigarette cards relating to football and it would be a pointless exercise to even attempt to list them so this is not going to be an in depth study of football cigarette cards but more of a quick overview of some of the main players in the area. It isn’t going to be a bibliography of the collections either, I’m not going to list all the players, or even teams (in most instances). Its simply going to show a few examples and give a little bit of background to the cigarette card issues that it covers. Cigarette cards of course came about when tobacco manufacturers realised that they could put advertising messages on the bits of cards they used to protect the cigarettes in the packets. They were originally known as “stiffeners” for obvious reasons. The first company to be credited with adding these stiffeners is an American company called Allen & Ginter so I guess they’ve a lot to answer for !! It took about five years before companies cottoned on to the advertising possibilities of this bit of card and W D & H O Wills became the British company to advertise its products in this manner in 1887. However it wasn’t until years later that companies realised that these cards gave them an opportunity to also encourage brand loyalty if the cards were in some way collectable ….. hence the sets that we are so familiar with nowadays began life. It is thought that Ogdens were the first British company to try and encourage repeat business this way when they issued what became known as “Guinnea Golds” in 1894. Of course it wasn’t long before the “brand loyalty” of football fans was used as a marketing tool and the first set of football related cigarette cards appeared in 1896, issued by a company called Marcus & Co these were named Footballers & Club Colours and are worth in excess of £200 per card now !! Since then there have been millions of football cigarette cards issued which makes it an absolutely brilliant area for football memorabilia collectors to get stuck into, whether its collecting complete sets, individual players or specific team related cards there is plenty of scope for anyone. Below is a link to a few pages where weve tried to give a quick overview of the relevant card issuer, it is by no means complete and we will be adding to it as and when we can !! Please note there are dozens more to be added but unfortunately time is short, however this page will be updated now and again so please keep popping back. Incidently if any of the above information looks familiar it maybe because you read it on one of my old football memorabilia sites "Footycigcards" ..... unfortunately managing several sites proved a cumbersome job so I decided to reconcile everything onto one site - this one ! !